Today, India is one of the world’s top destinations for education. With some of the best colleges and universities, it is renowned for its excellence and high standards. What’s even more interesting is how technology has advanced rapidly to transform the way students in India consume educational content. Additionally, the penetration of internet-based smartphones is taking quality learning to students across geographies in India. Today, little children are watching their favorite cartoons and learning pictorial rhymes on the same device. Education is being imparted to them through flexible and non-intrusive formats. As a consequence, students across all age groups are discovering the joys of learning and having fun while at it. There has been a noticeable shift in the perception of parents and teachers view digital learning too. Today, institutions are making efforts to shift the focus back on students to reinvent the way they learn right throughout their life. India might not have readily adopted education technology but it’s heartening to see how a traditional sector like education is using technology as an enabler so far. Today, some cutting-edge technologies are being used to further enhance this sector, while grabbing the attention of entrepreneurs, venture capitalists, corporates and governments. including even online courses, will be optimized entirely for mobile devices. Video learning has always appealed to students since it closely mirrors the traditional classroom teaching style. Earlier, students watched video lectures as a form of homework and then discussed them during the next class. Over time, this habit brought about a remarkable improvement in their performance, with a noticeable improvement in grades. Video lectures allowed students to learn subject syllabi at their own pace and dedicate time spent in class towards interactions. This will continue to be a trend in the future where students will have access to rich and interactive content, that will be useful for both formal training as well as performance enhancement. The increase in video-based learning on mobile devices will eventually account for 80 per cent of all internet traffic by 2019. Open educational resources also facilitate the creation of a flexible environment where teachers can customize educational content for individual sessions or classroom sittings. This is applicable for typical curricular subjects like mathematics, sciences and languages, as well as business and fine arts. VR allows students using e-learning platforms on mobile devices to directly interact with study material. This keeps their engagement levels high and motivates them to learn more and better. On the other hand, AR facilitates teachers and trainers in performing tasks, they previously haven’t or cannot, in a safe environment. technology also enables educators to boost their reach without making any significant infrastructure spends. This, in turn, benefits end-users by reducing the cost of services, while simultaneously adding value to their education. 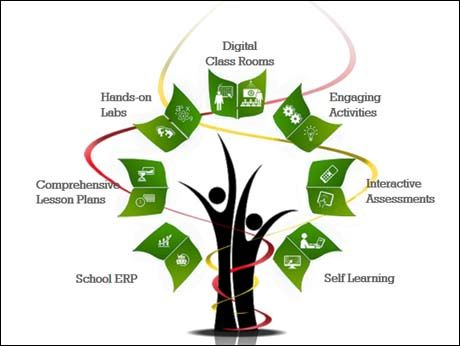 Learning platforms, softwares and digital devices are together creating countless new ways to modify education. This way, the academic potential, strengths, weaknesses, aptitude and learning pace of every single student is catered to. Precise, mobile and reliable applications are being created to teach students, help them practice their learnings, take assignments and manage their schedules. Schools are now providing their students with digital devices like desktop computers, laptops and tablets. These devices are aiding them in the teaching process while also helping them understand how students learn and how to enhance their learning process. The ‘one size fits all’ teaching model is being supplemented by adaptive,personalized learning pedagogies. Going forward, this will be the new trend in formal learning that will enable students to be technologically skilled and equipped for modern workplaces. In the traditional classroom seating scenario, students are unable to get the individual attention they need due to time constraints. In contrast, the one-to-one context of learning in digital mediums currently students to learn through videos and chat with an expert. The upcoming ‘Learning Management System’ will continue the two-way communication model between students and experts. More importantly, it will let students track their coursework progress, identify improvement areas and offer ways to make the most of them. Through the help of ‘Big Data’, experts will be able to capture student feedback within the framework of the content provided. With this alone, they’ll be able to improvise and enhance their offerings in new ways to further benefit students. retention, while the use of animation ensures that students understand complicated heories easily. Such technologies are more likely to be a game-changer in time, with visible developments taking place from 2018.